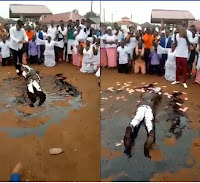 Home / Entertainment News, Featured Articles, Videos / This madness is too much now, See what this PASTOR did all in the name of performing miracles, Lord help us (VIDEO). This madness is too much now, See what this PASTOR did all in the name of performing miracles, Lord help us (VIDEO). Thursday, September 13, 2018 - Churches these days have been turned into comedy theaters. Pastors unleash madness during the so called ‘Healing and Anointing’ services where they fake miracles to brainwash their followers. Check out what this pastor was caught on camera doing. His followers were busy cheering and showering him with money.